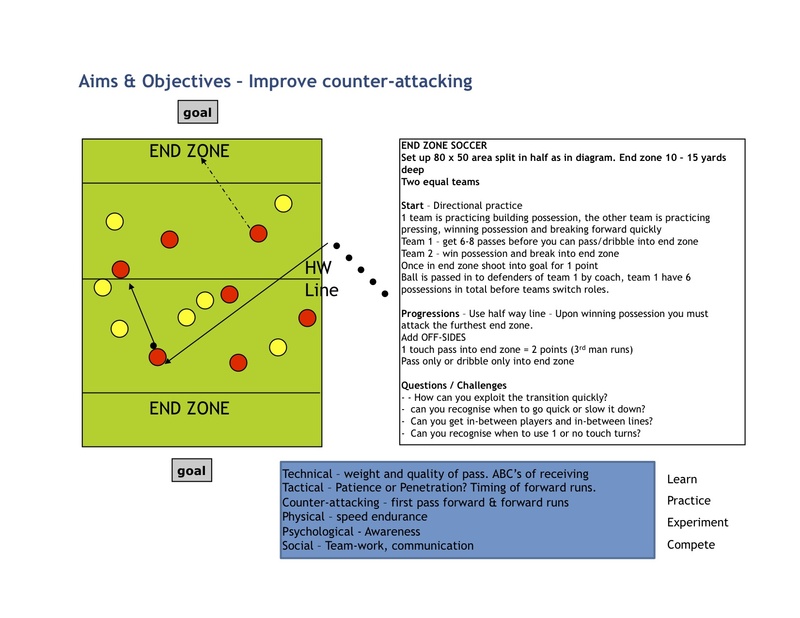 Counter Attacking by Dan Thomas. 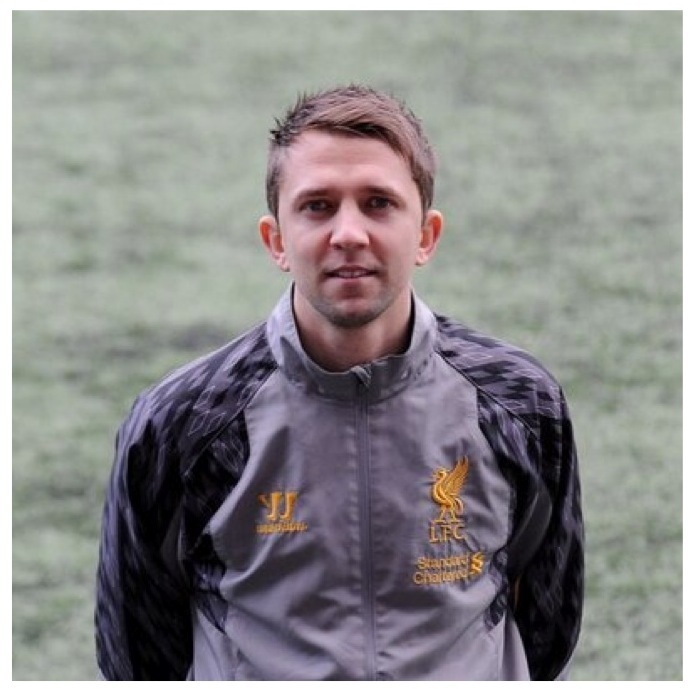 Dan is UEFA ‘A’ License Coach who is full time at Fulham FCs Academy. 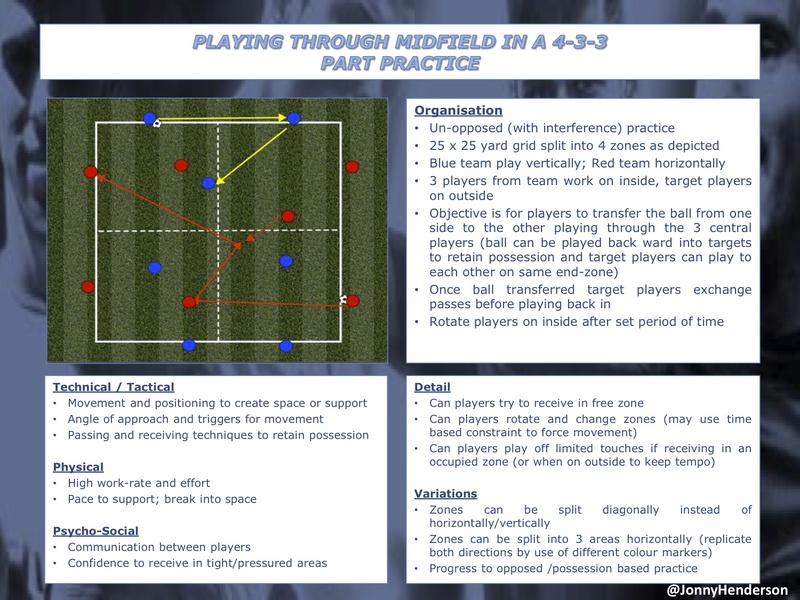 PLAYING THRU MIDFIELD IN A 4-3-3 BY BRISTOL ROVERS’ JONATHAN HENDERSON. JONATHAN IS THE HEAD OF COACHING AND ACADEMY MANAGER AT BRISTOL ROVERS. HE HAS UEFA ‘A’ LICENSE. 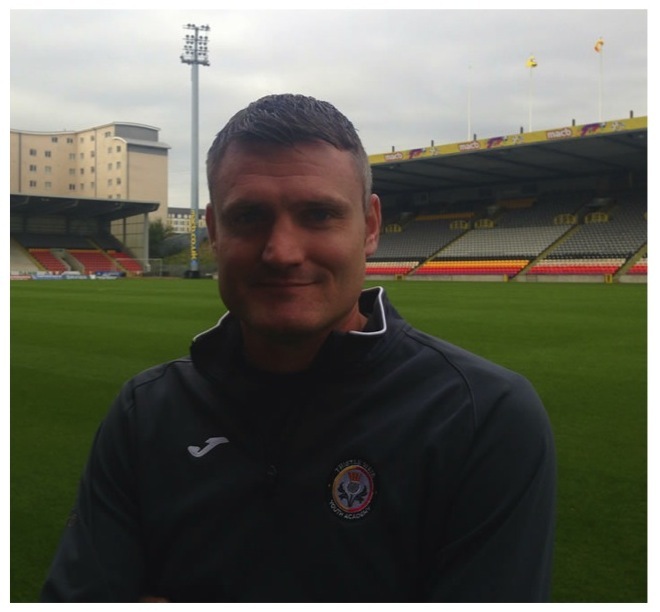 Scott is the Head of Coaching at the Partick Thistle Academy in Scotland. 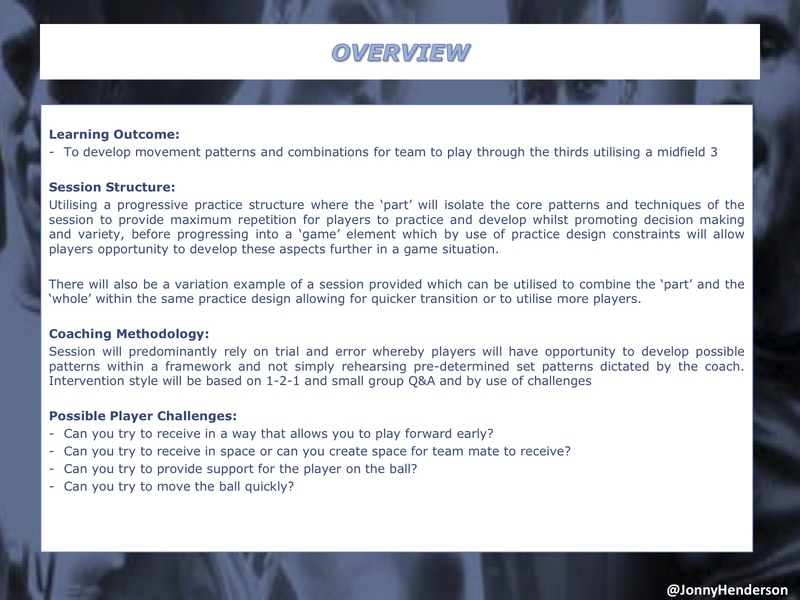 Ian Barker is the Director Of Coach Education for the NSCAA (National Soccer Coaches Association of America). Mark works for the motherwell FC Academy. He coaches the U11 team. 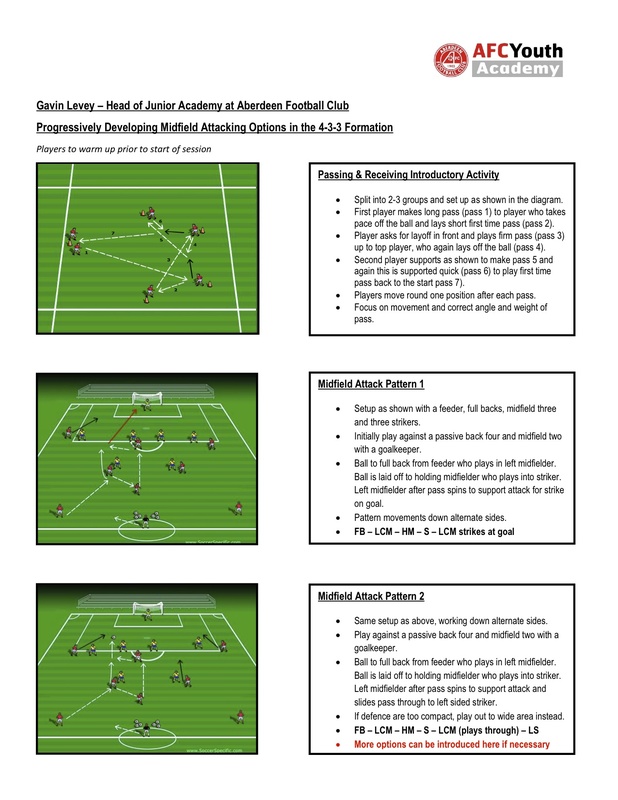 He has the Scottish FA Level 4 basic license for coach children and youth players. 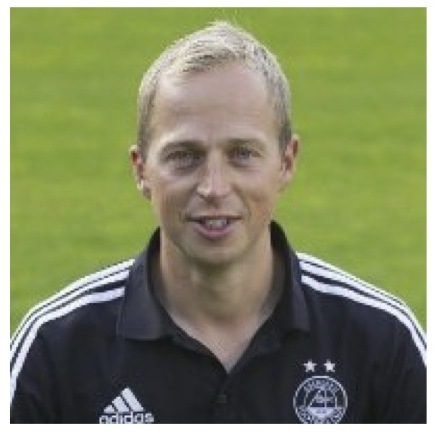 He is currently doing my UEFA B license and Scottish FA advanced children’s license. 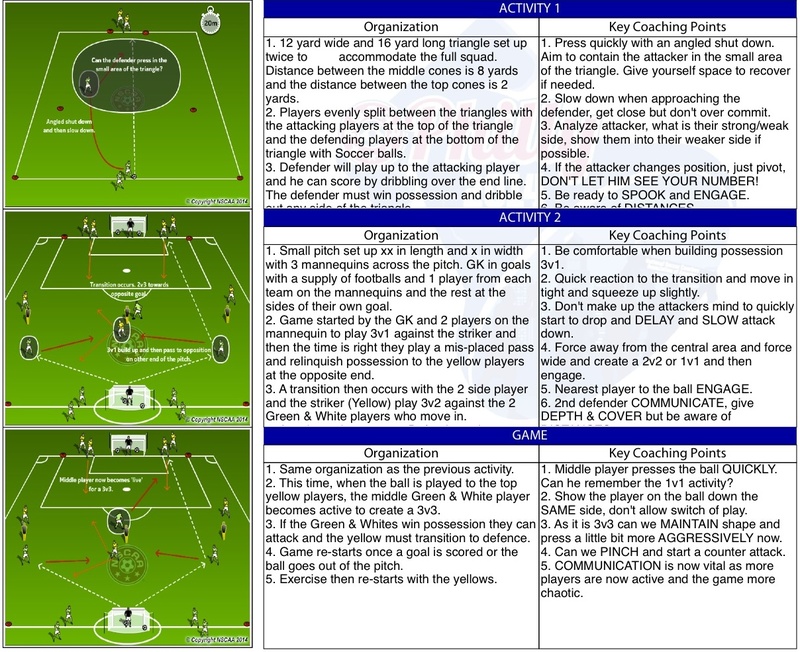 Explanation: Players dribble around the area looking for space. 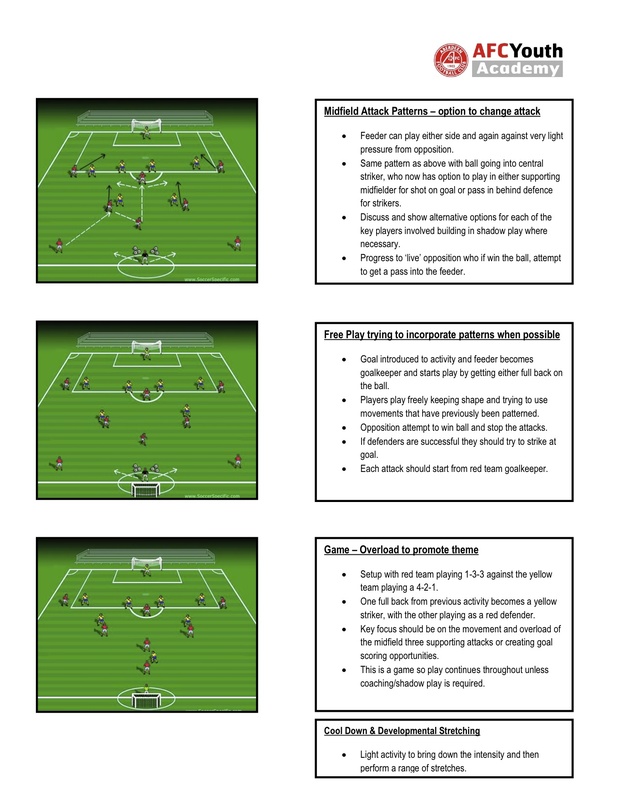 Players are asked to perform a variety of techniques, skills & turns. 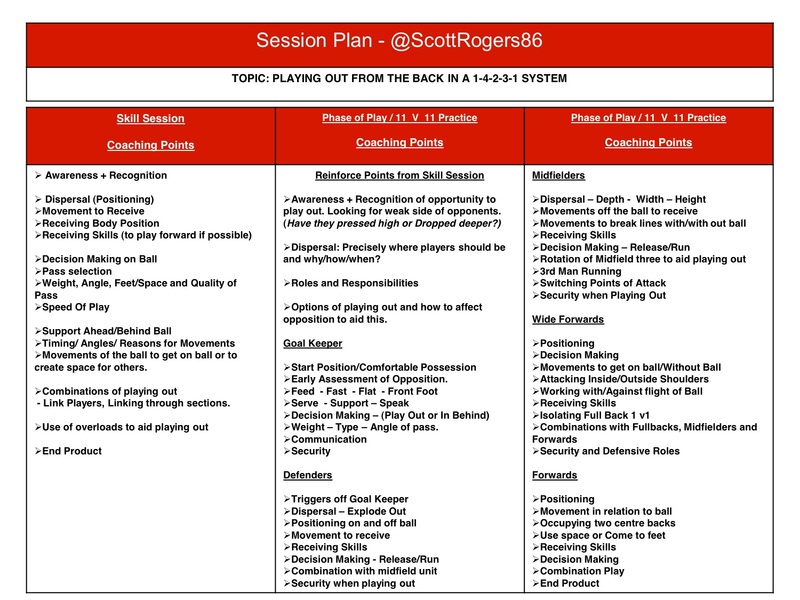 Encourage “trial & error” – allow the players to make mistakes while trying new moves. Explanation: Players are numbered 1-4. Coach will call a number and the players called must leave their pitch and complete a SAQ movement before joining the opposite game. 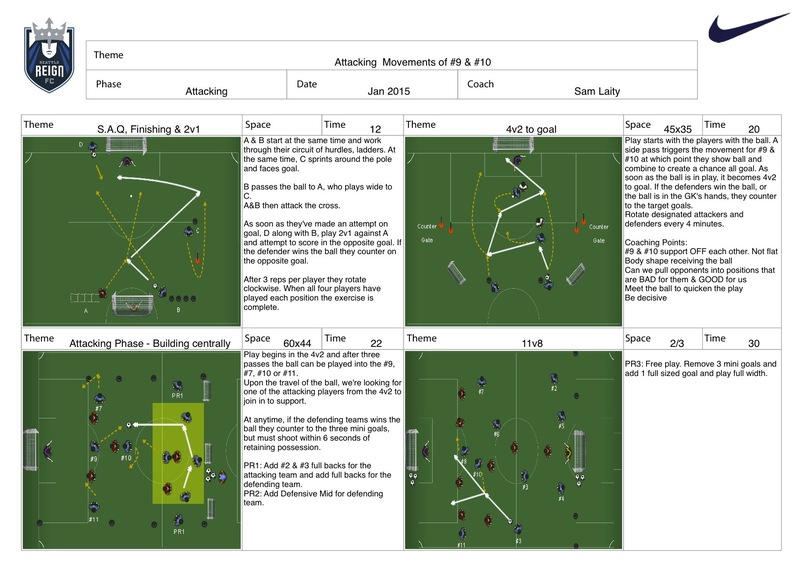 Explanation: Ball starts in one box and is passed from box to box with players following their pass. Player must control the ball using the inside of the foot. Control the ball in the direction you want to go. 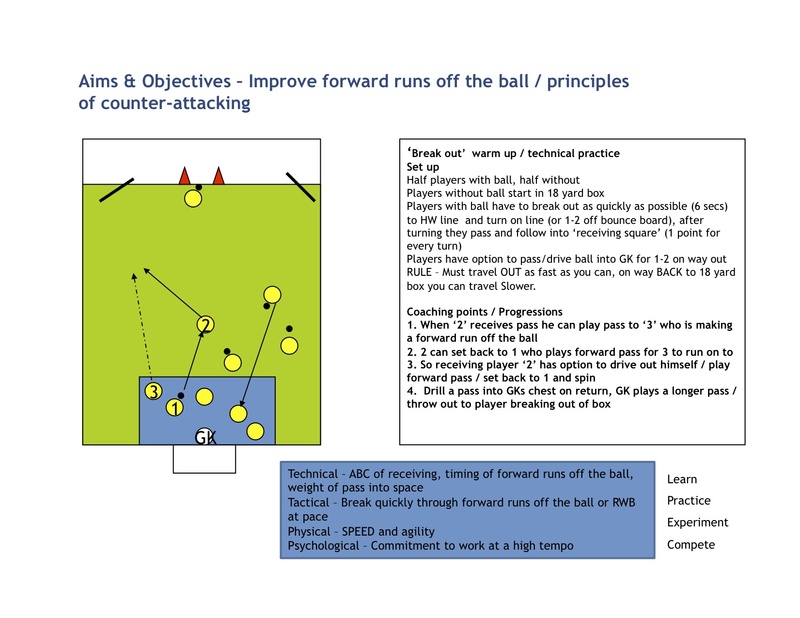 Player must control the ball inside/outside the box. 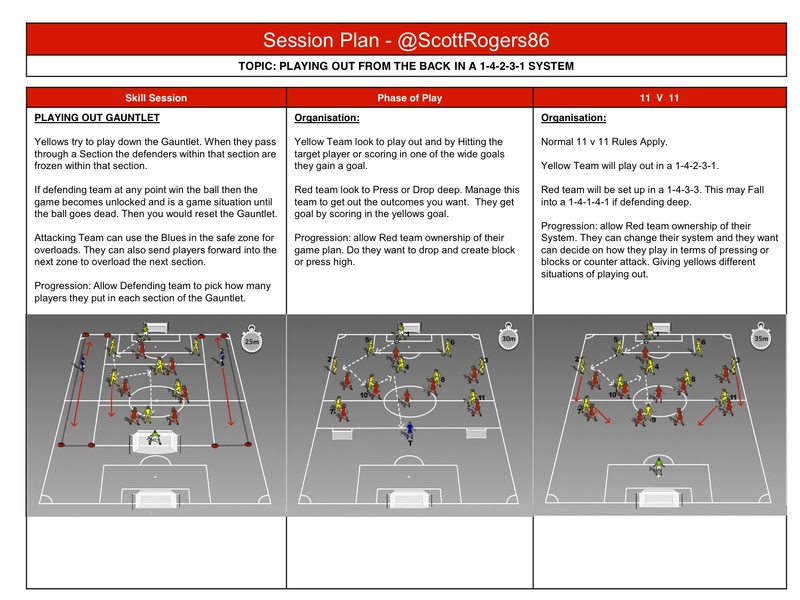 Explanation: Players in the middle play and attempt to play the ball to one of the zone men. Players in the zone must control the ball in the zone and play to one of team mates. 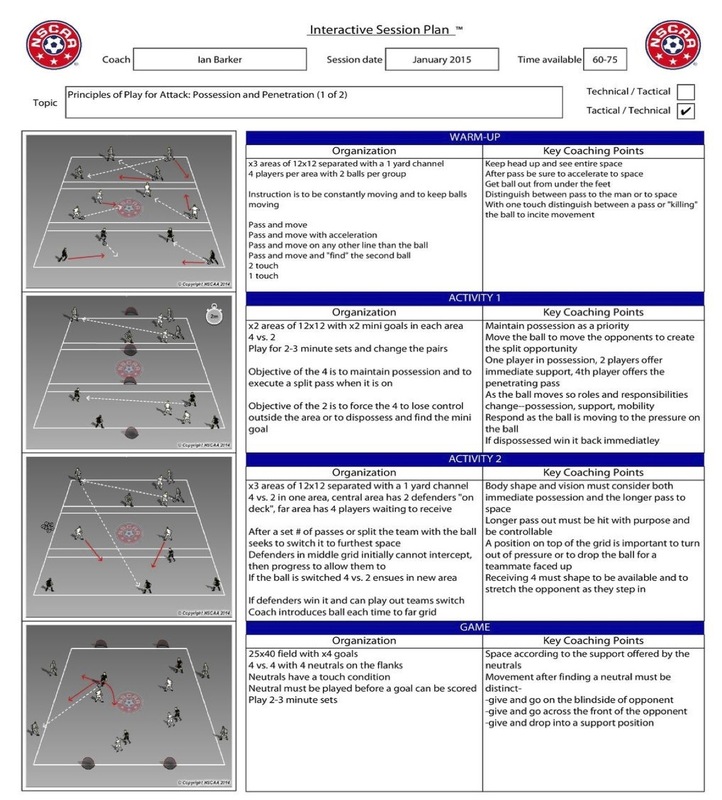 Progression: Players play the same game but this time when a zone player receives the ball they are allowed to dribble the ball out of the box and can join in with their team. A member from the opposite team has to occupy that zone that has been freed up. 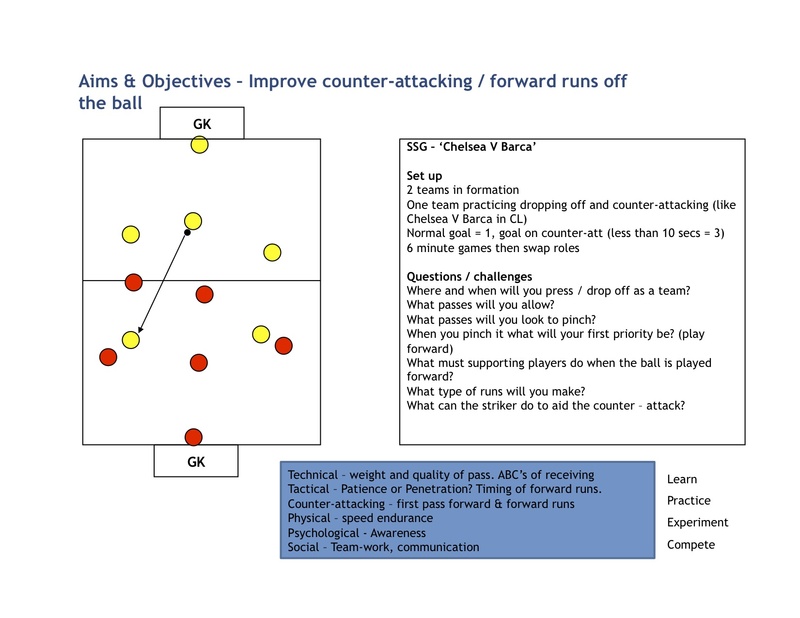 This will create an over load in the middle (6v4/7v5). Team in possession aim is to have all the zones filled with the opponent’s team then keep possession for a number of minutes. Player in the zone controls the ball outside of the zone and joins in with team. Player who passes ball follows ball and they become the end zone player. 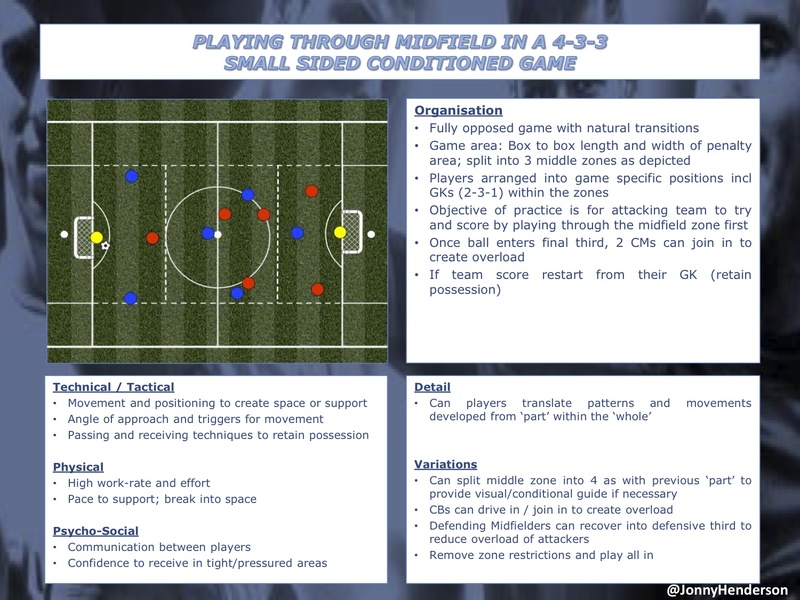 Explanation: Wide players have three touches when the ball is played into channel. Defending team cannot enter the channels. Players in channels must stay in the channel. 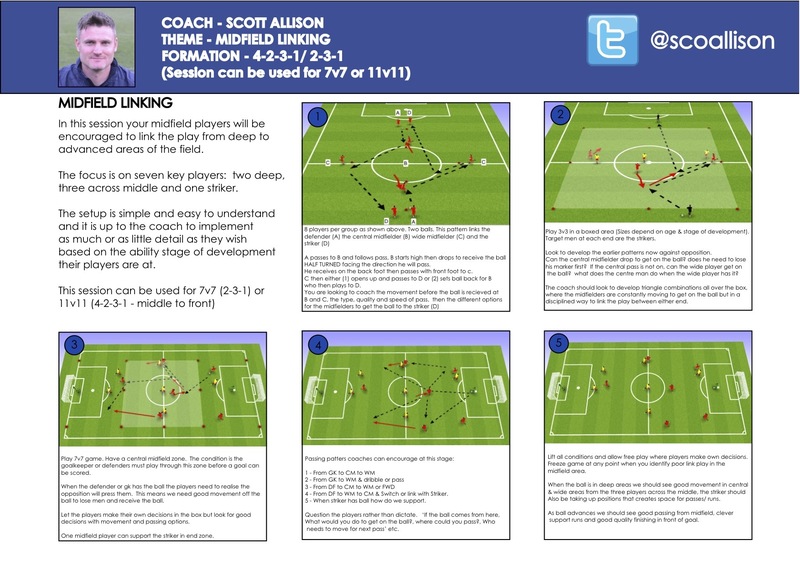 Look to open up the play and use wide players to penetrate further up the field.